R indicates re-entry of an album that had already charted. 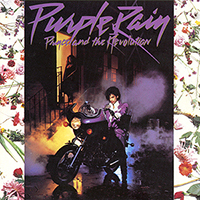 Purple Rain (the motion picture soundtrack to the movie Purple Rain) is the sixth full-length studio album by Prince, and the first to be credited to Prince and the Revolution. 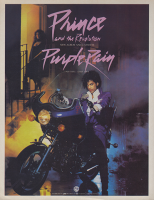 It was released worldwide in June 1984, a month before the movie, Purple Rain opened in theaters. Released a year and eight months after Prince's previous album 1999, it marked the longest period between albums to date. The album was mostly recorded between August 1983, and March 1984, although Baby I'm A Star had first been recorded in 1981. The last three songs on the album, I Would Die 4 U, Baby I'm A Star and Purple Rain, were recorded live at the 3 August 1983, First Avenue, Minneapolis, MN, USA show, although overdubs and edits took place on all three in September 1983. This marked the first time Prince had included live recordings on an album or on any release. In keeping with previous albums, all tracks were primarily written by Prince. Computer Blue features songwriting input by Dr. Fink, Lisa Coleman, and Wendy Melvoin. Dr. Fink also wrote a keyboard bass line for the track. Prince's father John L. Nelson was also credited for the Father's Song component of the track, which had been worked on during rehearsals on the 1983 leg of the 1999 Tour. The full band appears on four tracks: Let's Go Crazy, I Would Die 4 U, Baby I'm A Star and Purple Rain. Wendy Melvoin and Lisa Coleman also appear on Computer Blue, while the remainder of the tracks are essentially solo performances. Apollonia sings co-lead on Take Me With U. Three of the tracks include a string section arranged by Lisa Coleman and Prince, conducted by Coleman and Melvoin: Take Me With U, Baby I'm A Star, and Purple Rain. The string players are Novi Novog (violin and viola), David Coleman (cello), and Suzie Katayama (cello). The album produced five commercially-released singles, When Doves Cry (which preceded the album), Let's Go Crazy, Purple Rain, I Would Die 4 U and Take Me With U. Both When Doves Cry and Let's Go Crazy reached number 1 on the Billboard Hot 100. Prince supported the album with the Purple Rain Tour, his most extensive to date, and the first billed as Prince and the Revolution. Every song on the album was played regularly on the tour, which comprised of 100 shows throughout the United States, also including two shows in Canada. 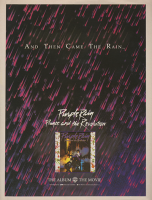 On 4 August 1984, after 3 weeks in the chart, Purple Rain reached number 1 on the US Billboard Top Lps And Tape chart, where it remained for 12 weeks (the album remained almost a year in the US charts). It also reached number 1 on the US Billboard Black LPs chart, remaining at top position for 19 weeks. In Canada the albums topped the RPM Top 100 Albums chart for 17 weeks, and the "The Record Top 40 Albums" chart where it remained 13 weeks. The albums fared also well in Europe, reaching number 1 position in the Netherlands (for 3 weeks), top 5 positions in Germany, Sweden and Norway, and top ten positions in the United Kingdom, Switzerland, Austria and France. Boosted by the success of the Purple Rain movie, the album catapulted Prince to international stardom as the album outsold all of his previous (and subsequent) albums, selling 13 million copies in the US and 5 million in the rest of the world. The album was certified platinum by RIAA two months after release, on 29 Aug. 1984. By November 1984, it had reached 8x platinum and in January 1985, 9x platinum indicating 9 million copies shipped in the USA within 7 months. On 16 May 1996 the album was certified 13x platinum by the RIAA and reached the "Diamond album" status. The album was remastered at Paisley Park Studios in 2015, overseen by Prince. See Purple Rain Deluxe for details on the remaster making-off and release. All songs written by Prince (credited to Prince and the Revolution) except where noted. "All thanks 2 God – the light, Lisa & Wendy, Bobby, Mark & Matt – the Revolution, Big Chick – the protector, Steve, Bob & Joe Ruffalo – the producers, Albert Magnoli – the director, Peggy Mac – the patience, Fred Moultrie – the money, Lee Phillips – the brains, Warner Bros. Records & Film – belief, God 4 the "rain", Sandy – the care, The Time – "chicken grease", Apollonia 6: Susan, Brenda & Apollonia – patience, wisdom & beauty, Jill – love, Roy Bennett – loyalty, David Leonard – the blade, Susan Rogers – energy, Carol McGovney – devotion, God – 4 the rainbow, William Blinn – the story, Alan Leeds – the expert." "Thanks 2 Don Thorin and all the cast & crew of Purple Rain: Clarence Williams, Olga Karlatos, Kim – hi, Morris & Jerome, Katy, Billy Sparks – what up 'tho? Richard Arrington – God – 4 the sun, Wally Gator, Dez Dickerson & the Modernaires – Steve & everybody at 1st Avenue – all the extras & anybody else we foolhardy forgot 2 mention." US and UK Press adverts for this album. Two early configurations of the album are known to exist containing alternate tracks and/or alternate versions (see Alternate Album Configuration column above). 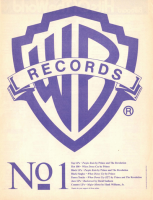 Warner Bros. Records claimed first-day sales of 1.3 million copies for the album. The high figure was backed by retailers in a Billboard article on 7 July 1984; initial orders had sold within 3 days, having them to re-order a large number of units to face the demand. The "Prince Purple Rain" logotype that was originally commissionned by Warner Bros for the movie was later adapted by graphic designer Jay Vigon for the album cover. Even though he's not credited as such, Ed Thrasher, an art director previously employed at Warner Bros. Records, was the album cover art director. He also designed the Purple Rain movie poster.